In 1960 I graduated intermediate science from Chamadiya College Fathehpur and in 1962 graduated with B.SC. from Poddar College Nawalgarh. These two years I stayed at Yaadgar hostel in Nawalgarh. During those days, Shri Nawanathji Maharaj used to be staying at Sanganeriya Bagichi (name of the house) in Nawalgarh. He was a realised saint and he was Shri Shraddhanathji Maharaj’s vachan (mantra) guru. Therefore Shri Shraddhanathji Maharaj used to visit him occasionally. 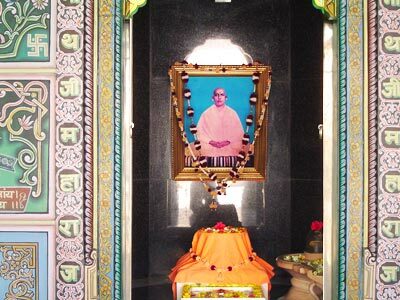 When I used to hear about Shri Babaji Maharaj’s arrival in Nawalgarh, immediately I would visit the Bagichi for his darshan (sight). Whenever I visited Shri Nawanathji Maharaj always had kheer (rice pudding) and laddus (Indian sweet) for me. Sometimes Shri Babaji Maharaj would spend the night outside the Shiv temple in the Yaadgar hostel and I would easily get an opportunity to spend time with him. Sometimes he would stay at Passariya House (another boy’s hostel in Nawalgarh) and I would also get a chance to stay with him in the night. About five kms towards south-west of Nawalgarh, there is a small village called ‘Posanni’. Whenever Shri Babaji Maharaj visited the village he would stay in the village dharamshala ( rest house). Whenever I heard about his arrival in Possani I would immediately reach the rest house and spend time with him. Posani village head, Shri Chunnilalji always served Shri Babaji Maharaj with tremendous love and affection. Shri Chunnilalji also served food and water to the devotees visiting Shri Babaji Maharaj in the rest house. Although Shri Chunnilalji was elder to Shri Babaji Maharaj, Shri Chunnilalji had accepted Shri Babaji Maharaj as his spiritual guru even before Shri Babaji Maharaj had taken the saffron cloth (signifies sainthood). Shri Chunnilalji was simple hearted, truthful with high integrity. Before the construction of Shri Nathji Maharaj’s Ashram, Laxmangarh, Shri Babaji Maharaj, similar to Shri Vivekanandji, roamed from village to village, meeting educated youth and leading them to the path of love and self respect. No one knows how many were benefited from Shri Babaji Maharaj’s grace – he took away bad karmas of many, cured thousands, blessed many infertile women with children and helped thousands of the poor and the needy. His charisma, his love and affection for everyone was such that he is still alive in devotees’ hearts. During my student days and even after joining the army in 1963, I spent my summer holidays in the blessed company of Shri Babaji Maharaj, travelling from village to village in the Shekawati region. I was immensely attracted to him and found absolute peace in his company. He also treated me like a child and always showered his grace upon me. After every summer holiday when I had to leave him to go back to my duty in the army, I always missed his company and my mind was always absorbed in his memories. This incident took place in 1973 when I was attending an 18 months Advanced Communications Engineering Course in the Military College, Sikandrabad. I used to go to college on the scooter and one morning while on the way to college I fell asleep while driving my scooter. In front of me was a military jawan (soldier) going on his bicycle. My scooter hit his bicycle from behind. His bicycle broke down and God alone knows how, the soldier climbed on the mudguard of the running scooter. Now he was sitting on the mudguard facing me, but the scooter kept going and I was still asleep. I woke up hearing the soldier’s shouting ‘please stop, please stop the scooter’ and asked him ‘how did you manage to climb here?’ I stopped the scooter when he said ‘I have no idea how this has happened, but you hit my bicycle and the bicycle is lying broken down some 30-40 meters behind us’. I asked him if he was hurt and he replied that he was hurt slightly in his ribs. I gave him money to get his bicycle fixed and went to my class. This is such a surprising incident – how the scooter kept going while I was asleep? This is all due to Shri Nathji Maharaj, he can do anything. I would like to mention another incident which took place in 1982. I was working in CQAI Raipur, Dehradun and I used to commute to office by scooter. The office was about 6kms away and typically I left home between 8:00am and 8:30am. The road to office was full of potholes and there were stones piled up on either side of a narrow road. That day I saw a jeep coming at fairly high speed from the opposite direction. To dodge the jeep I tried steering to the sides but the jeep hit the scooter hard and I was thrown some 7-8 meters away. I was in my army uniform and nearby people immediately came to help me and took me to a nearby military hospital. My scooter was completely crushed and was still stuck underneath to the jeep tyres. Despite such a bad accident I just had a hairline fracture on my little toe, which got cured in few days. Shri Nathji Maharaj saved me from almost a death – after the hit when I was falling to the ground, I had a glimpse of Shri Babaji Maharaj’s saffron cloths. I felt as if he caught me in his hands like a ball and dropped me gently on the ground. I do not remember falling to the ground, I found myself standing only.